Feel free to substitute other kinds of jam in the filling. You'll need to use a food processor to combine the jam and cream cheese; if you don't have one, you can mix them by hand, but the mixture will look curdled. If you don't feel like mixing the cheese and jam together, just spread a bit of cream cheese and then a layer of jam on top of each pancake. Other good pancake spreads are peanut butter and Nutella; you may wish to add thin slices of banana if using either of these spreads. Make the pancakes: Combine flour, salt, baking soda, and sugar in a large bowl. In a separate bowl, combine eggs, buttermilk, oil, and vanilla. Add the wet ingredients to the dry ingredients and mix to combine; do not overmix. Heat a large skillet over medium-high heat. Grease the pan. Using a ⅓-cup measure, pour the batter in circles into the pan. Cook until golden brown and cooked through, 1 to 2 minutes per side. 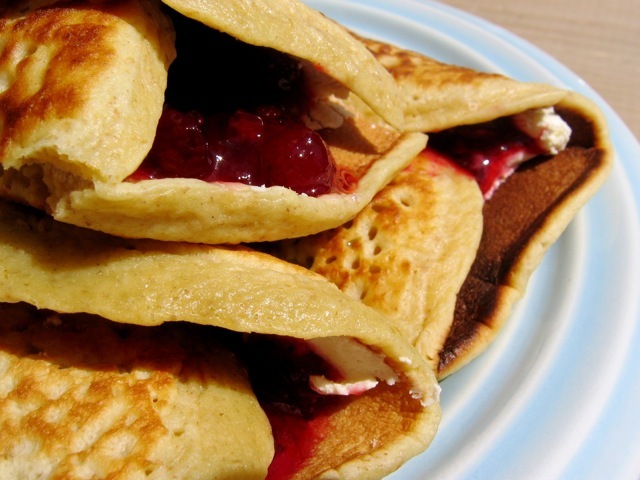 Arrange cooked pancakes in an even layer on baking sheets. Freeze until firm, about 1 hour. Place frozen pancakes in a ziplock storage bag in the freezer until ready to use. Make the filling: Combine cream cheese, jam, and vanilla in the bowl of a food processor. Process until smooth, about 30 seconds. Transfer to a small container, cover, and refrigerate until ready to use. Assemble roll-ups: Heat a pancake in the oven at 350 degrees for about 5 minutes or in a microwave oven. Spread 1 heaping tablespoon of filling on the pancake and roll the pancake tightly. Wrap in foil (the pancakes will crack as you roll them) and serve immediately. Read more about quick and healthy breakfasts for kids in Keri Fisher's "The breakfast club."